Geomesh™ is the ideal solution for land management, earth retention, soil stabilization, erosion control, construction and landscape applications. Geomesh™ was designed with added flexibility and strength exclusively for the construction of gabions and mattresses. Geomesh™ is manufactured using our innovative galvanizing after welding process that ensures the wire is completely galvanized in all the weld areas, making it extremely resistant to corrosion, even in the harshest environments. For added protection, Geomesh™ is also available with a specialized PVC coating designed and tested to meet ASTM requirements. 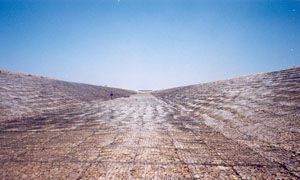 Geomesh™ is constructed to withstand movement without any loss of structural integrity making it the perfect choice for any erosion control project.